1-Needle, Unison Feed, Walking Foot, Large Hook, Large Bobbin, Alternating Presser Foot, Fully Automatic Lubrication System, Safety Clutch Device. 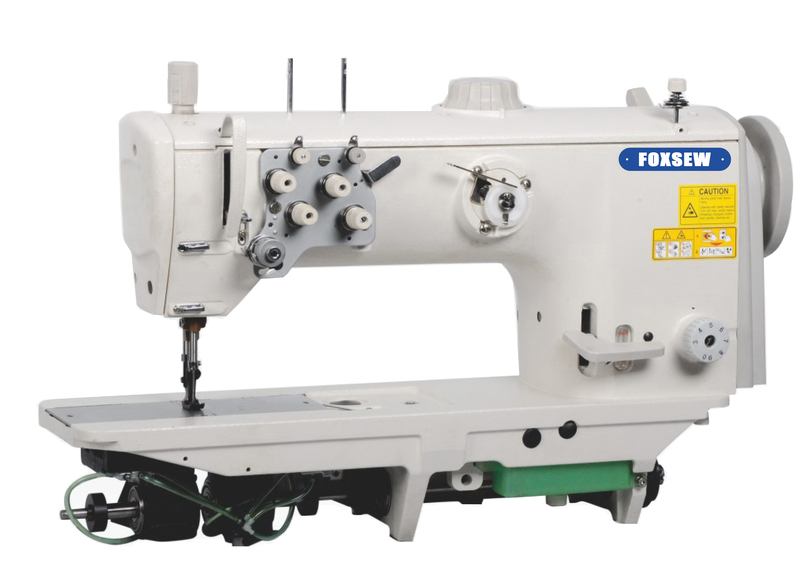 FOXSEW FX-2810 1-Needle Unison Feed Walking Foot Heavy Duty Lockstitch Upholstery Sewing Machine. This machine is with large hook and sewing kinematics for high seam quality, secure and tight stitch formation with thread size maximum up to Nm 10/3. The Large clearance facilitates the handling of large area work-pieces. Extremely high sewing presser foot lift, the high top feed stroke allows a safe climbing over differently high materials plies, high efficiency owing to automatic functions like automatic thread trimming, automatic backtacking, and pneumatic sewing presser foot lift as well as additional functions like integrated second stitch length, additional thread tension and quick stroke adjustment. Universal sewing operation in the field of medium heavy duty applications. Larger needle bar stroke, higher presser foot lift, and newly adopted double-tension mechanism, the machine offers excellent sewing capabilities and responsiveness. The machine's rectangular feeding motion promises the consistent feeding of materials of all thicknesses without stitch gathering. It can also make sure feed smoothly while sewing heavy duty and complicated materials, and difficult to move for upper and lower materials. Applications for sewing and abutted seam process for sofa, office chair, leather products and outdoor goods. The stitch length can be easily selected by the stitch dial; The machine is provided with many improved features that offer enhanced operate such as an easy-to-observe area around the needle, placement of the bobbin winder on the front face of the machine arm, The machine is equipped as standard with a safety clutch for preventing hook breakage. Looking for ideal Single Needle Compound Feed Machine Manufacturer & supplier ? We have a wide selection at great prices to help you get creative. All the Leather Upholstery Sofas Bags Handbags are quality guaranteed. We are China Origin Factory of Furniture Upholstery. If you have any question, please feel free to contact us.